For Twelve Gates Arts’ new gallery’s inaugural show, Unwritten Wills, Nandini Chirimar processed family memories and legacies embedded within significant family objects. Mixing sparse monotone drawings, mixed-media pieces, and treasured yet mundane family items, Chirimar explores the “wills” that our family imparts to us through objects and the memories associated with them. Ultimately, the show provides insight into family material cultures and the memories we inherit. Even without any further analysis, the precision and purity of Nandini’s drawings is striking. 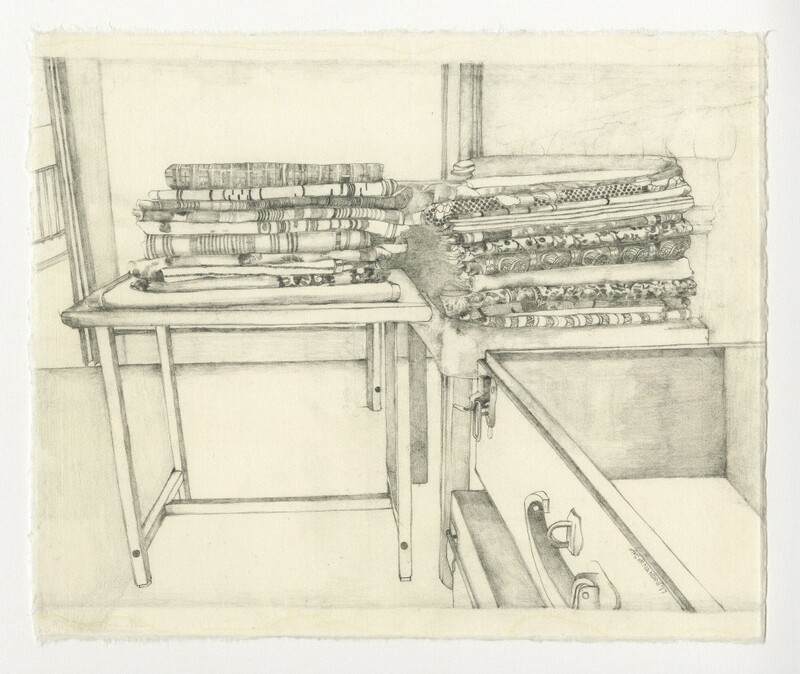 The first six pieces of the show are drawings of seemingly mundane family items, such as a computational journal or a chest filled with saris. Some drawings have backdrops, like a kitchen or bookshelf, while others are portraits of the object without context. 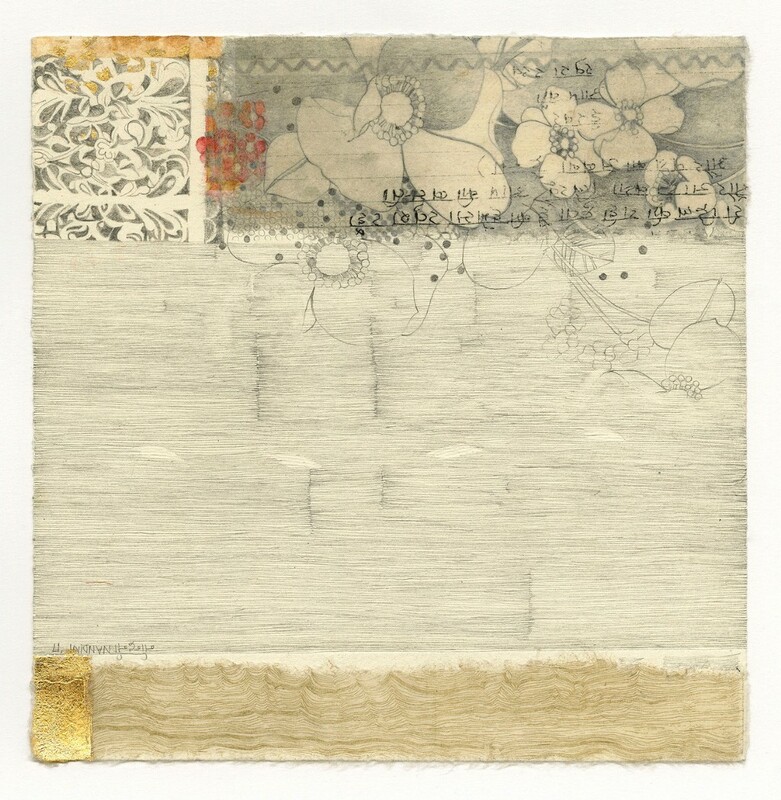 Perhaps informed by the painstaking attention to detail required for Japanese block printing (Chirimar has spent fifteen years, including four in Japan, developing this practice), she explores every aspect of the objects, laboriously depicting the fray of a favorite kerchief or the wear-lines on a bamboo mat. While Chirimar was intentional in the metaphorical depth of the pieces — she described the parallel and sometimes intersecting lines of Her Bamboo Mat as emotions overlapping — their aesthetic precision is itself remarkable. These drawings’ black-and-white composition sets the foundation for the later pieces that more deeply explore memory. The fine details of the pieces, which are most clear in Minor Details, calibrate the viewer to mind the nuances of objects. After all, the most emotionally provocative elements of memory are usually the least conspicuous. Contrasted with Chirimar’s clear object depictions are numerous mixed-media graphite drawings layered with etchings and watercolor of multi-colored sari patterns and red-ink flowers. 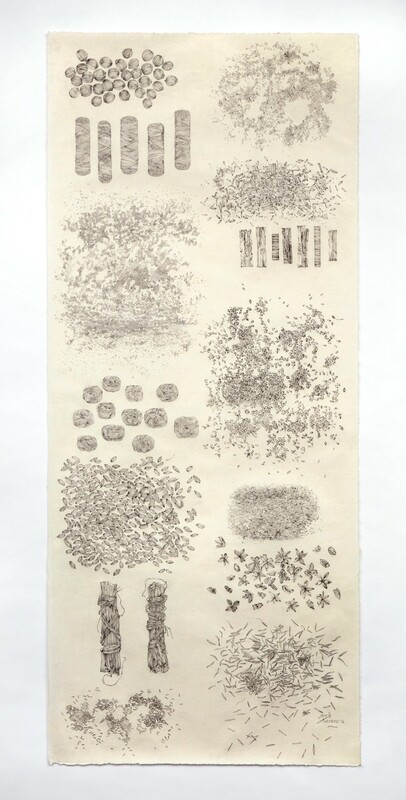 The mixed-media series begins with two aerial-view depictions of the aforementioned miscellaneous objects together with minimal color, followed by twenty-two more complicated pieces. The pieces’ aesthetic complexity contains allusions to the various elements that make up memory: the addition of red ink might signify smell, whereas the multi-colored sari prints recall the touch. Chirimar’s works remind us that memory is not a moving picture show, but rather a complex fabric blending the smell of daal, the feel of silk, and that “Modern Table Book.” Additionally, the mixed-media pieces’ repeated titles (“Aerogramme” is, for example, the title of seven separate pieces) sheds light on the way memories not only blend together, but how those mergings become difficult to differentiate over time. For Chirimar, these personal items repeated throughout the show are not merely physical objects, but are, in fact, imbued with memories, emotions, and stories. Such, when her nanny left her a beloved red napkin, or math computation journal, they imparted significant dimensions of themselves. In this sense, the suitcase containing these mementos was filled with wills written in personal connection rather than ink. In the end, Chirimar leaves the audience pondering what we actually receive from our departed loved ones and how the physical objects we inherit have much greater weight than the force they exert on scales.